Tatachilla Lutheran College is presenting the major musical, ‘Joseph & The Amazing Technicolor Dreamcoat’, in the Hopgood Theatre, Noarlunga Centre. 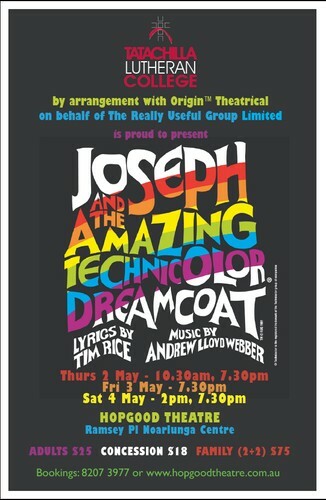 Open to the general public for 5 shows only - Thurs 2nd May 10.30am & 7.30pm; Fri 3rd May 7.30pm, Sat 4th May 2pm & 7.30pm. The Biblical saga of Joseph and his coat of many colors comes to vibrant life in this delightful musical parable. Joseph, his father’s favorite son, is a boy blessed with prophetic dreams. When he is sold into slavery by his jealous brothers and taken to Egypt, Joseph endures a series of adventures in which his spirit and humanity are continually challenged. He is purchased by Potiphar where thwarting advances from Potiphar’s wife lands him in jail. When news of Joseph’s gift to interpret dreams reaches the Pharaoh (wryly and riotously depicted as Elvis), Joseph is well on his way to becoming second in command. reveals himself leading to a heartfelt reconciliation of the sons of Israel. The performance will run for approximately 90mins with no interval making the show a great night out for the whole family!